Willy-nilly, Colonial Service memoirs from the Pacific carry a built-in danger. The threat is that they will be looked on as a poor man's Grimble, that consummate 'born story-teller' (P.14) in Bevington's own opinion. Eric Bevington, who served in the Gilbert and Ellice Islands 1937-42 and then in Fiji from 1942 to 1965, with a brief break in Nigeria in 1945 and a long secondment to war-torn Brunei in 1954-58, need have no waves of worry about any invidious comparisons. His memoir (apart, if I dare, from the unharmonious, superficial levity of the title, reminiscent of Harry Franklin's tongue-in-the-cheek, prima facie facetiousness of The Flag Wagger (1974), though in the event both are respectable, genuine and in no way the set-up Aunt Sallies they imply to the immediate title-reader) is a model of this style of Colonial Service memoir; enjoyable, informative, accurate and perceptive, as delightful to the general reader as it is relevant to the student of imperial history. Add to this the quite remarkable quality of the whole production - printing and paper, cover, maps and illustrations - and one at once welcomes a positive and worthwhile addition to the Colonial Service bookshelf. Part 1, labelled 'Service Initiation' represents the bulk of the book, 144 out of its 164 pages. Consisting of a series of chapters, part vignette and part narrative, about this and that aspects of the life of a District Officer in the pre-war Pacific Islands, it takes the reader into the trials, tribulations and triumphs of the rites de passage of cadethood - ('a poor vintage', p.7, is how he describes the Cambridge course of 1936-37; others may want to differ? ); through service under the inspiring Maude, the lovable Luke (passim, especially Chapter VIII) and the caring Garvey; to that morning in December 1941 when, following the bombing of Pearl Harbour by the Japanese, Bevington was ordered to evacuate Tarawa and make for Suva. Mercifully, he thus missed the brutality of the Japanese executions on Tarawa (p. 124). 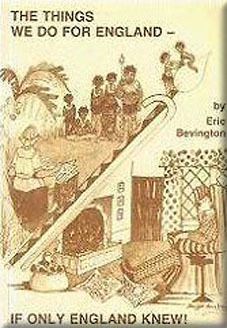 Then came Eric Bevington's first home leave, after eight years away from Britain (!) Though he did not know it at the time, this was the end of his days in the field. It is a small pity that each chapter is not given the conventional signposting of a title (it could so easily have been done): the Contents page looks, in consequence, bleakly 'unterrific' as Fred and Ginger found the Pacific in their celebration show of yesteryear. Follow the Fleet (1936). The rest of Bevington's service was to be in central government, culminating some fifteen years later in his appointment as Financial Secretary of Fiji. That period is covered, all too abbreviatedly, in Part II. The author is so sound and interesting on the classic debate between Secretariat wallahs and field service (Chapter XII) that I for one could have done with more than this a-page-a-year allocation, in exchange for which bonus I would have willingly parted with Chapter XIII, devoted to another debate: the justification and balance sheet of colonial rule. For me, the most memorable paragraph in this rigorous defence of 'the things we did for England' is that pointing out how change in the UK was as disorientating to the official on leave as was 'development' in 'his' colony. 'Change at home . . . often struck more forcibly than all the other changes' (p. 158).